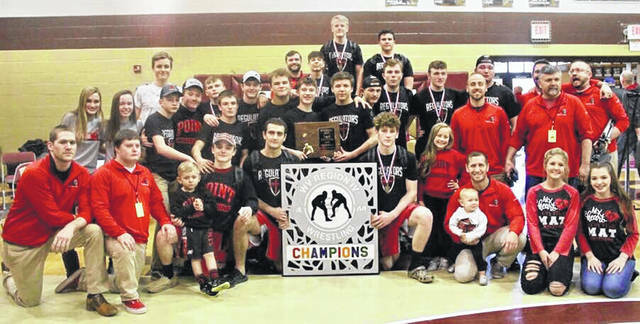 Members of the Point Pleasant wrestling team pose for a picture after winning the 2019 Class AA-A Region IV championship on Saturday at Williamstown High School in Williamstown, W.Va.
Wahama senior Antonio Serevicz, left, maintains leverage on an opponent at the Skyline Bowling Invitational held Dec. 29, 2018, at Gallia Academy High School in Centenary, Ohio. WILLIAMSTOWN, W.Va. — A sweet 16. Mason County will be well-represented at the 2019 state wrestling tournament after having 16 total athletes advance out of the Class AA-A Region IV championships held Friday and Saturday at Williamstown High School in Wood County. Both Point Pleasant and Wahama had at least one regional champion and multiple state qualifiers at the two-day event, but the weekend truly ended up being all about the Big Blacks. PPHS — the top-ranked Class AA program in the state — earned nine divisional titles and had all 14 grapplers advance to Big Sandy Superstore Arena while rolling to a program-best 321.5 points en route to its third straight AA-A team crown. Winfield was the overall runner-up with 150.5 points, while Wirt County came away as the top single-A program with a third place effort of 147 points. The White Falcons placed ninth overall in the 15-team field with 61 points, as well as fourth as far as single-A schools went. It will be the second time in program history that Point Pleasant will be sending competitors to state in all 14 weight classes, joining the 2012 squad. That 2012 team won the last of three straight double-A crowns and also held the previous school mark with seven regional champions. The Big Blacks also earned the program’s ninth regional championship in school history, joining the 2006, 2007, 2008, 2010, 2011, 2012, 2017 and 2018 squads. The Red and Black combined for a 41-5 overall record in their collective matches, and each grappler also scored at least one pinfall in their respective divisions. Given the dominance that his team displayed over the course of two days, 10th-year PPHS coach John Bonecutter was pleased with the overall effort at the regional meet. But, as he noted, it’s time to start focusing on a bigger prize down the road — the one the runs through Huntington. Isaac Short (106), Christopher Smith (113), Derek Raike (120), Justin Bartee (126), George Smith (132), Mitchell Freeman (138), Wyatt Wilson (145), Logan Southall (160) and Juan Marquez (182) all posted 3-0 records en route to coming away with weight class titles. Southall and Marquez notched three pinfalls apiece, while Short, Raike, Bartee, Freeman and George Smith each recorded two pinfall wins. Both Smiths also scored a major decision each, while Freeman added a 17-0 technical fall. Jacob Muncy gave PPHS a 10th grappler competing in a regional final, but the heavyweight ultimately went 2-1 overall with two pinfalls while placing second. Zac Samson (152), Nazar Abbas (170), Nick Ball (195) and Wyatt Stanley (220) also advanced to state as the quartet placed third in their respective weight classes with identical 3-1 marks. Samson recorded three pinfall victories, while Abbas, Ball and Stanley each came away with two pinfall wins. The White Falcons ended the weekend with an 11-10 overall record in head-to-head bouts, which also included a nice slice of history for the Red and White. Senior Antonio Serevicz became the first Wahama grappler to win a regional championship in five years after going 3-0 with two pinfalls at 220 pounds. Jacob Bennett (126) and Kane Roush (170) both won divisional titles as seniors at the 2014 regional meet. Trevor Hunt also qualified for the state meet after finishing third with a 3-1 mark and three pinfalls in the 145 division. Hunt dropped a 1-0 decision in the winner’s bracket semifinal to Point’s Wyatt Wilson, who went on to win the weight class crown. Wes Peters ended up placing at 152 pounds after finishing sixth overall with a 3-3 record and three pinfall wins. Emma Tomlinson (106) and Trevor McGuire (138) also had a win apiece by decision for the White Falcons. Winfield joined PPHS with multiple weight class champions in Jamie Ward (152), Chance Dixon (170) and J.D. McCallister (195). Will Frampton of Nitro also accounted for the heavyweight title. The 2019 WVSSAC Wrestling Championships will be held at Big Sandy Superstore Arena from Thursday, Feb. 21, through Saturday, Feb. 23, in downtown Huntington. Visit wvmat.com for complete results of the 2019 Class AA-A Region IV Wrestling Championships held at Williamstown High School.